Two years after the beginning of the Arab Spring, the promise of revolutions remains unclear. What we have learned: social media is a very inadequate tool for revolutionary change. Earlier this year, I was taking part in a panel discussion about social media in the Arab world. One panelist was actually from the Arab world; the rest of us were Europeans and Americans. The lone Arab voice stood silent for much of the discussion until he declared timidly at the end that, in his opinions, Al Jazeera played a bigger role than social media. People talked about TV coverage of the rebellions, he said, not about tweets. TV beat texting as an enabling force of revolution. TV retains the advantage of still being somewhat of a “communal experience.” The fact that millions of people can watch the same program at the same time provides a common ground on which people can discuss issues the following morning. The limit consists in the access barriers to TV. It is not by chance that the presidential guard in Egypt was dispatched to protect the presidential palace and state TV when clashes erupted between supporters and opponents of President Morsi in November. During the past sixty years, every single coup d’etat in the Arab world was soon broadcast from the occupied studios of state-owned TV and radio stations. Social media might not be as important as TV, but it can’t be neglected either. Actually, the use of social media is more widespread than we might think. 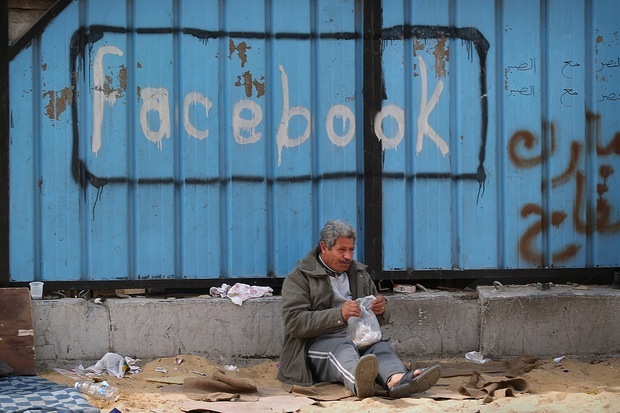 According to a recent survey by PEW Research, 34 percent of Tunisians use social media websites; in Egypt, it’s 30 percent; in Jordan, 29 percent. We can expect that most of the users are young and live in urban areas – i.e. in the centers of the rebellions. A relatively high percentage – between 60 and 68 percent – also told PEW pollsters that they use social media to share political content. The revolts in the Middle East might have benefitted from many different media platforms. In addition to TV and social media, we should not forget newspapers and word-of-mouth either. Yet the question today is somewhat different: what message do the revolutions convey? With Marshall McLuhan (“the medium is the message”), we might ask: what is the content of the Arab rebellions? I believe this is the key question of 2012. The content of the revolts hasn’t been clarified yet. By nature, revolutions are “negative” rather than “positive” movements. They tend to express social rage and destroy. The constructive phase comes later. We may believe that the French Revolution started off as a quest to realize the enlightenment values of “liberté, egalité, fraternité” – but that would be a misreading of history. While the values were present to a certain degree, few people in the streets were actually aware of them. Schoolbook historians added the “brand” of the revolution afterwards. The intellectual discussion about the possible path of the French revolution often took place in what we might call “slow media” today: newspapers and books. They were read and shared by the French elite in its attempt to seize the revolutionary process and reshape society. Is Facebook ready to play a similar role today? Sadly, the answer is no. I am becoming increasingly pessimistic about Facebook’s revolutionary potential. Social networks are great for generating and concentrating attention on a particular issue, but there’s reason to be skeptical about their ability to facilitate the elaboration of revolutionary thinking. Twitter and Facebook are driven by instinctive reactions, not by the articulation of carefully articulated ideas. Articles can become immensely popular one day but fade into oblivion over night. Clicks and likes and retweets don’t constitute revolutionary sacrifice. They are individual actions without larger significance: clicks, clicks, clicks, and even more clicks. I can’t remember a single “popular discussion” that has been contained within 140-character containers and contributed something of lasting interest. A post on a social network is not the proper format for discussion – it’s just a box for quick thoughts. It might attract immediate viral attention, but it doesn’t really share ideas or deepen our understanding of an issue. Indeed, the fights that regularly erupt on Twitter are ridiculous: there is no way to reach agreements within the confines of 140 characters. If it happens nonetheless – as it sometimes does – it still looks weird. Yet social media and traditional media are tightly interlinked. The risk of uprisings is that the revolutionary process may be seized by elites that control traditional media outlets (which cannot easily be controlled by the masses). Revolutions are delicate things, and even a small actions can have far-reaching consequences. Big actions, such as the assertion of control over mass media, can have even more dramatic effects. Facebook may help to dismantle existing power structures, but TV may help to protect them. This is true not only in the Middle East but in the West as well. What remains of the Occupy movement? In the lives of most citizens, not much. The problem was that Occupy attempted to increase the number of people marching in the streets. But its strategy resembled a digital approach, applied to the real world. That didn’t work: a click is easier than convincing your beloved partner to pack up your stuff and spend indefinite time camping in a park and shaving at McDonalds toilets. Most employed people preferred to stay at home rather than join communal urban camping sites. But there has also been an ideological problem. The Occupy movement galvanized around a common message of protest, but its horizontal and leaderless organizing structure led to stagnation rather than action. There have been attempts to share ideas through bulletins, videos, and books, but I doubt that they were read and seen by many. Who cared about Occupy, in the end? Has the protest been able to produce a leader? A Robespierre, a Lenin, a Che Guevara, or even an amicable Daniel Cohn-Bendit? I doubt it. Occupy spawned some iconic images, but the people portrayed in them were not integrated within any hierarchies – just look at Wikileaks’ Julian Assange. Facebook is a non-hierarchical medium for the dissemination of short tidbits of information. Basing an actual revolution on the structure of Facebook would reproduce these problems – “the medium is the message.” There is no revolution without leaders. Social media might produce a few, but their terms usually end after a few hours.